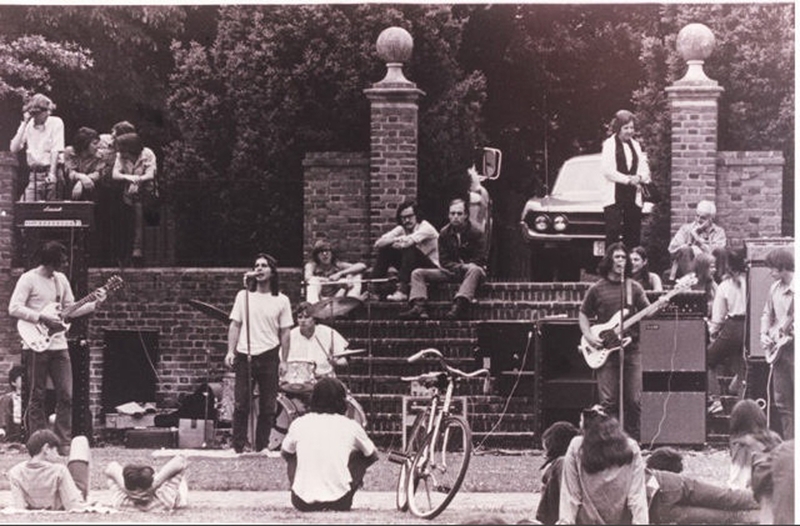 This is an ongoing upgrade of musical memories from our musical adventures at William and Mary, featuring the Original Mind and Body Sandwich (aka, the Tim Tyler Band) and Waterfall. Personnel of the former: Tim Tyler, John Coffey, Lee Graves, Tim Auckerman, Karen Devitt and Rix Reeser. Waterfall–Richard Ahlfield, John Coffey, Reid Graves, Lee Graves and Seth (Bill) Graves. Survival of the fittest among W&M freshman. Leg: I was in JBT1. Had a bass but didn’t know how to play it. A breakthrough came when my friend Bruce Chapman (of “Fishing Without a License” fame) broke out his keyboard and we jammed on “So Glad You Made It,” which is so simple it consists of only two notes, the root and its octave. But rock ‘n’ roll juices were flowing. Leg: I moved from JBT to Old Dominion and made the acquaintance of Tim Tyler. Tim had played before and had an amp that I could use for bass. I am unsure of first real rehearsal or how the pieces came together. Reid: I remember the OM&BS rehearsals in the basement of JBT. You guys had a great sound. I remember hearing Tim Tyler playing some great stuff on guitar. You guys played some complicated numbers too. “Light My FIre”, “You Keep Me Hanging On”, “Living in the USA”, “Touch Me Babe”, “White Rabbit”, “Somebody To Love.” I vividly recall you guys playing “Come Together” and being very impressed. Leg: Tim was big into Cream, so we also had “Crossroads” and “Born Under a Bad Sign” in the set list for OMBS. “You Keep Me Hanging On” was a show-stopper. Also Karen Devitt’s songs. Also, as chronicled in “Confessions,” OMBS played in front of OD one night during the middle of protests, and the cops came and told us to shut it down. What rebels. John: I also remember playing in the area above the third floor at least once, likely with Tim Tyler’s band. I remember candles for light and a somewhat mysterious general scene. OM&BS also played in a club in the basement of a building opposite the soccer field on Jamestown Rd. Also, the practices in Blow gym turned into performances. The Original Mind and Body Sandwich at the Peace Ball at W&M, spring of 1969. Rix Reeser on vocals, John Coffey on drums, Lee Graves on bass (left) and Tim Tyler on Fender Strat. John: Peace Ball was indeed spring, 1969. We already had the Original Mind and Body Sandwich name because I had the day-glo sign behind me (my own little way of waving my freak flag high!). I know you already have the attached picture, but I offer it as proof that we were OM&BS at the Peace Ball. I am pretty sure we were Waterfall from fall, 1969. Leg: Tim was no longer at WM the following fall. John and I were eager to keep something going, so we lassoed Roy Morrison and Richard. Auckerman also was with us but did not have the same enthusiasm, although he was a good player. I think we were always Waterfall. John: Lee tells wondrous stories about Woodstock outside OD. I remember that it was the first time I saw Lee after returning to campus. We stood between Blow Gym and OD for a LONG TIME catching up on the summer’s events. I think Lee already knew about Tim and Rix Reeser being gone. I think it might have been the start for me of agreeing that we should keep going as a band. 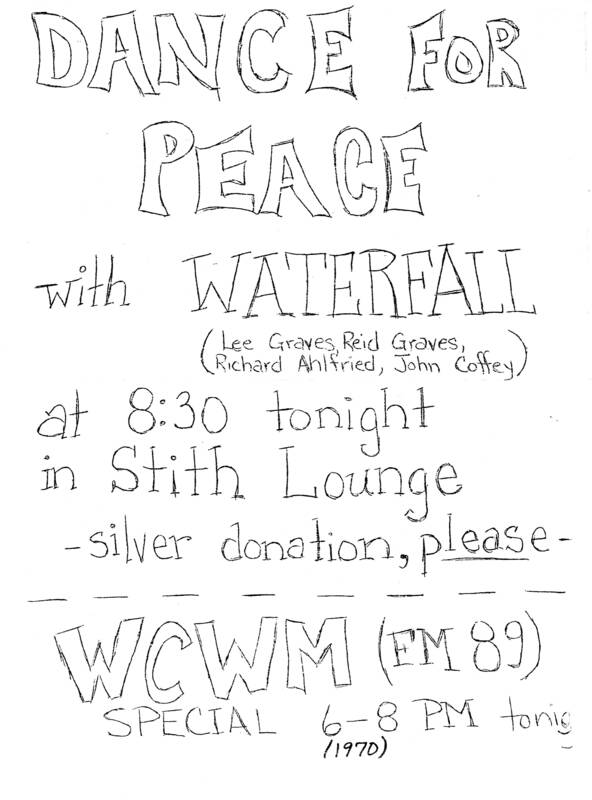 Reid: I recalled you guys played outside in the Sunken Gardens (Oct. ’69 I believe it was). I recall being involved somehow, I suppose helping set up. I remember watching your guitarist, Roy Morrison, play some really good stuff that afternoon. He had a great sound that day. I was curious what type of gear he used. He used a Fender Jaguar for his guitar. Was he running it through a Silvertone 2×12 amp? Tim Auckerman played an organ, a Farfisa I believe. He liked to bang on the reverb tank to make a spaced out sound effect. Leg used a red SG EB style bass, right? Don’t know what amp Leg used though; probably the Bassman. I recall trying to play “Foxy Lady” with you guys, but I didn’t do a very good job playing it. In hindsight, how did I even get the Waterfall gig? Guess it pays to have a brother in high places. It was an beautiful autumn day, but a bit too windy and cold to! be playing outside. And I think that line-up lasted until December of ’69. Leg: I remember well the Sunken Garden thing, and I think you’re right on those details (my bass was the cherry Gibson EBO through the Bassman). I really wanted you to play with us (when have I not?) but you’re right, Foxey Lady was more like Skunky Lady. Not our best moment. But it got your feet wet and planted the seed of having you in the band. Roy and Auckerman bowed out later that year — my junior, your freshman — and we worked really hard to improve as a foursome. Mom and dad delivered the Kustom amp right before one gig, and you and I created hybrid setups, me with the Kustom head and Bassman cabinet, you with the opposite, playing with your Tele. 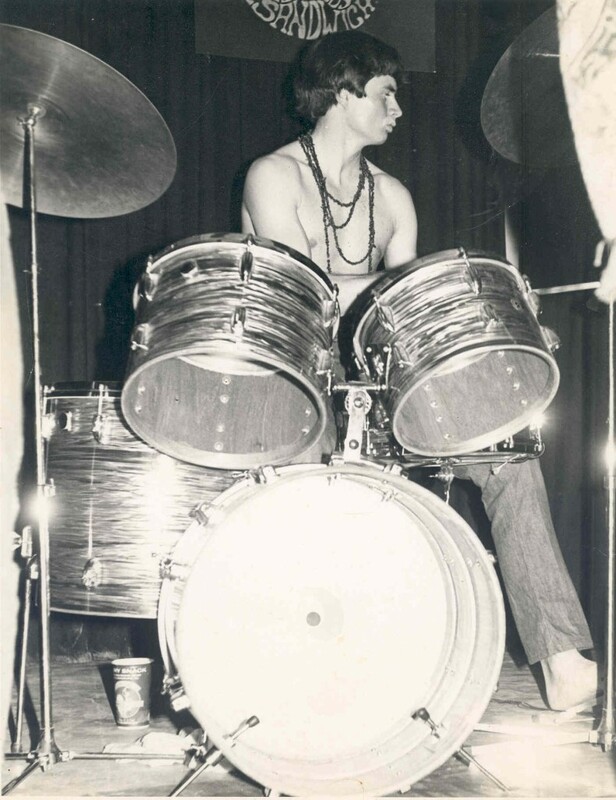 Richard: I never had the honor of performing with the OM&BS. 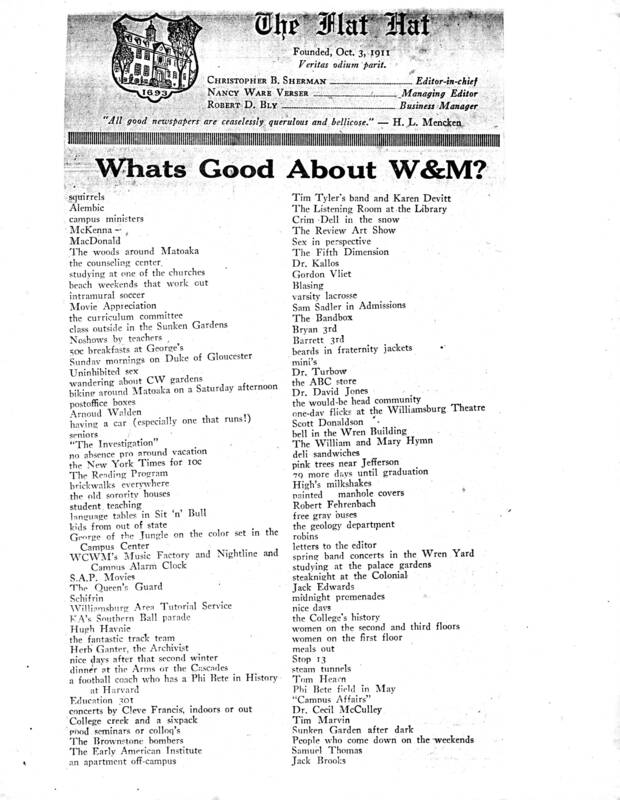 By the time I got to W&M…at the same time, I believe, that Reid arrived on campus at W&M for the 69-70 academic year…the OM&BS had disbanded. I transferred to W&M as a junior, from George Mason, having stayed in Northern Virginia so as to keep my vocalist spot with the New Del Phonics. I moved into JBT2. Roy Morrison was in JBT1. To this day, Lee, I’m grateful that you recognized me at W&M, no doubt from our earlier days as freshmen together at Woodson. Leg: Richard, in terms of recognizing you that first semester after you transferred, it was because I was a big New Del Phonics fan and made a big effort to come to your gigs. I think you played Sadie Hawkins at Woodson one year. You and the English Setters were my faves. 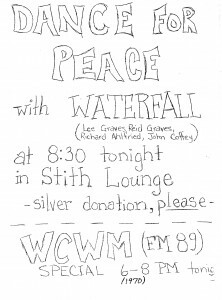 Richard: In December 1969, Waterfall played a Christmas gig at JBT2, in the lobby. I remember parts of it vividly; other parts, apparently, were never effectively encoded (as was commonly reported by subjects during the historical era known as The Heavy Period). John: Wow, Richard, thanks for reminding me!! Both JBT buildings had semi-circular open spaces to the back opposite the middle front doors. I recall that we played in that area. Does that jell with your memory? Leg: Richard, I also remember that JBT2 gig. Roy M. and Tim A. were playing that one. John: I remember when we played in the basement of Stith. I think that might have been Reid’s first job. Is that correct? To this day I remember having a cowbell for Honky-tonk Woman and playing that song that night. I might have just gotten the cowbell. Leg: Mom actually made (as in sewed herself) a pair of flowery bell bottoms for that gig because she wanted to be hip with the groove. And, yes, Fortunate Son (urk). But that was a fun and important gig for us. I remember one frat gig, when we were still a foursome, at the end of the 1970 spring semester — not Sig Ep — where we were super tight. We actually had a riser to play on, and we were very confident. Rocked em! John: I remember that we settled on practice in Blow Gym. We went up the steps of the side entrance next to OD, then down the stairs in the corner nearest to James Blair Hall to an open area that was almost like a really big landing (maybe more stairs going to the basement?) I remember one particular practice in Blow Gym when our LSD friends showed up halfway through, visited some powerful psychic stimulants upon us and practice wound to a halt about 45 minutes later. Leg: The summer was a watershed time for Waterfall. I remember we slaved over building a box for the Chevy pickup truck, The Gray Goose, specifically for band gear. Seth was tagged to join the band and during the summer we got him primed on some of the material. Before classes started, we had band rehearsals in the old frat lodges. We were intensely serious. John: I also remember fall senior year when we got back early and practiced in one of the fraternity lodges and then played outside OD. We played SigEp and the Pub several times that year. I am pretty sure that we played at least a few other fraternities as well. Reid: Do you remember playing a gig in a house? We set up in one of the rooms in this house (dining room?) and people were talking, some dancing, milling around. The house was small, and just off the campus close to the Campus Center, down the street. One of the reasons it stuck out in my mind was due to spacing out and forgetting where I was in one of the songs. Came in late or awkward transition to a song I normally would never flub up. Funny what you remember. It’s fun to think back. John: Reid, you are thinking of a little white house on Boundary St. It housed WATS (Williamsburg Area Tutorial Service). It was a pre-school for underprivileged kids. I volunteered there until the kids completely got the better of me (different story). I remember it well. Someone (Lee, I think) brought a record player. I distinctly remember hearing James Gang’s “Yer Album” for the first time there – this thunderous bass and all this trippy music. It was love at first listen with that band. I have not a clue how we did playing. Richard: Of all the music I have sung, some of my most exhilarating moments have been singing the following with Waterfall: Procol Harum’s “Lighter Shade of Pale,” Doors “Light My Fire,” and Who “Tommy.” As you know, the organ parts figure prominently in the first 2 songs. I really miss singing with an organ in the mix. Leg: I agree that many of my musical highlights have been with Waterfall. You definitely brought a note of professionalism that raised the bar. Remember the vocal-only practice sessions we had in my room at OD? We were serious! For a PA, I recall a 35-watt Bogen amp, way underpowered, and two small columns that we later upgraded. Equipment-wise, Harv I remember you using a Muff Fuzz and a Morley wah-volume pedal. Is that right? Reid: For Waterfall, I did use a small Muff Fuzz that plugged directly into the input of the amp…not a floor model with a foot switch. No, that would have been more expensive…maybe 3 or 4 dollars more that now command between $500-1000 now on eBay. So when my leads came up, I’d have to turn around, switch the Muff Fuzz on, hear that dreaded “Pop” and turn around and play the lead. My timing had to be just right, too. The Morley Powerwah Boost was back with Wet Dog. I miss some of the songs we used to play back in the day, but didn’t include in our reunions. Like “I Can See For Miles”, “Funk #48” (not 49), “Dreams of Milk and Honey”, “You Don’t Love Me”, “Living Loving Maiden”, “Back To the Family”, “Jumpin’ Jack Flash”, “Into The Sun”, “Please Don’t Worry”, “I’m So Glad”, “Nothing Going'”, “Fortunate Son”, “Down By the River” (well, those last two songs…I don’t miss them much), “To Cry You A Song”. “I Dig A Pony”, “Two Of Us”. Do you remember songs we tried to work up? Like “You Got Me Floating”, maybe “Lost Woman”, “Cowgirl In the Sand”, or “Alice’s Restaurant”? Leg: Harv, I remember struggling with some of those songs we tried and abandoned. “I Dig a Pony” never quite made it to our A list. “I Can See for Miles”–wow, power plus. We struggled a little with the harmonies of “Down By the River.” Either OMBS or Waterfall also did “Communication Breakdown.” I do not remember at all the gig in the house you describe. Wow, gotta try to conjure that one up. One memorable one for me once Seth joined up was an outside gig at one of the picnic pavilions by Lake Matoaka. I was playing so hard and stretching strings on the bass that I broke one of my strings. Only time EVER I’ve broken a bass string onstage. Reid: I remember that gig at Lake Matoaka and it was a good one! It was a beautiful spring day. And let’s not forget the gig at Nag’s Head and the truck breaking down with a flat tire. Aarrgghh. But that was a fun weekend and we played well. Leg: Remember the Hoi Polloi? That started up my senior year. We were somewhat of the house band (probably along with Cato Parish). Reid: The gigs at the Hoi Polloi were the best. Especially in the larger room off to the right. As you entered that room, there was a stage off to the left. It was just the right size for all our equipment, but always a little tight for all of us. It was recessed into the wall, almost like an extra large closet opened up to the larger room and with a slightly raised stage as the floor. Great place. I recall playing a really inspired version of the Who’s “Touch Me, Feel Me, Heel Me” during one of our gigs. We had great dynamics on that song, building up the volume and intensity with each verse. Wow! 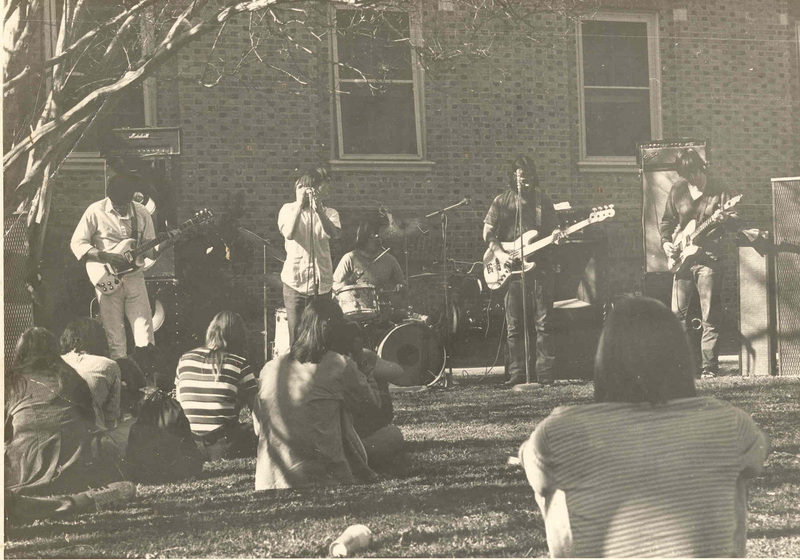 Leg: Coming full circle, we played the Sunken Gardens again when Seth was with the band. My memory is that our final gig was in the Sunken Gardens in the spring just before graduation. It was a bittersweet day. 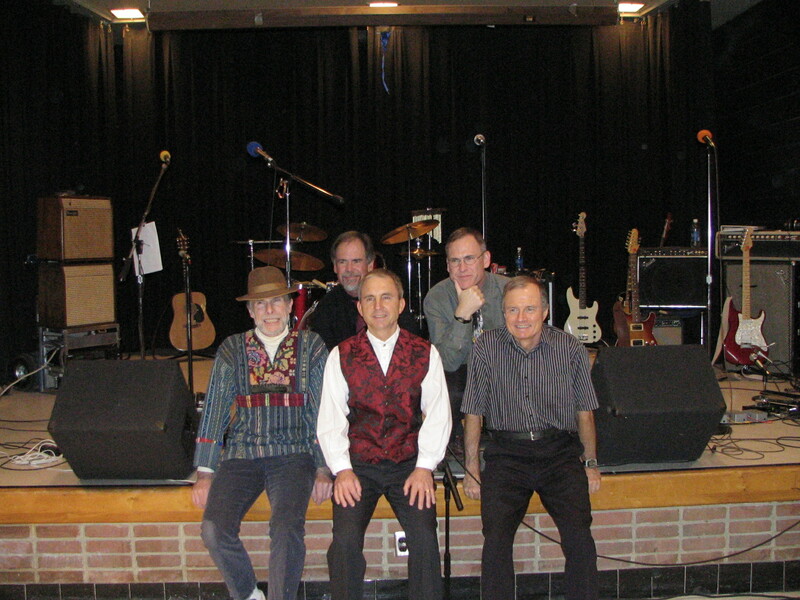 Waterfall at Little Theater Reunion, William and Mary: Seth Graves (from left), Lee Graves, Richard Ahlfield, Reid Graves, John Coffey.